You know the circus, or you think you know the circus: lion tamers, tightrope acts, trapeze. You spend your $8 for the traveling Mexican family circus, or your $18 for the burlesque steampunk circus. Perhaps you are a parent whose kids cannot get enough of The Greatest Showman, a hit movie about the Ringling Bros. and Barnum & Bailey circus that is no longer a circus. Whatever "the circus" means today with its many incarnations, Cirque du Soleil has been doing it eye-poppingly since 1984, when its vibrant neon spasms first thrilled a well-to-do patron under the big top. Running through Feb. 3 in San Francisco inside a climate-controlled tent adjacent to the Giants ballpark, Cirque du Soleil's new show Volta ($54–$165) is a procession of skits, fantasy, acrobatics, skill, and insanely ridiculous outfits even your grandmother would not be caught dead wearing. Volta hints at a vague sort of story, involving uniformed human drones addicted to their cell phones and a blue-haired dreamer among them who dares to be different. This, of course, is immaterial: you're invested in the show for the two-story trampoline act; the strongman hoisting a woman aloft, one-handed, while riding a unicycle; the double-dutch routine fast enough to power a small city; and the unbelievable aerial routine by the woman affixed to a hanging rope by her hair alone. 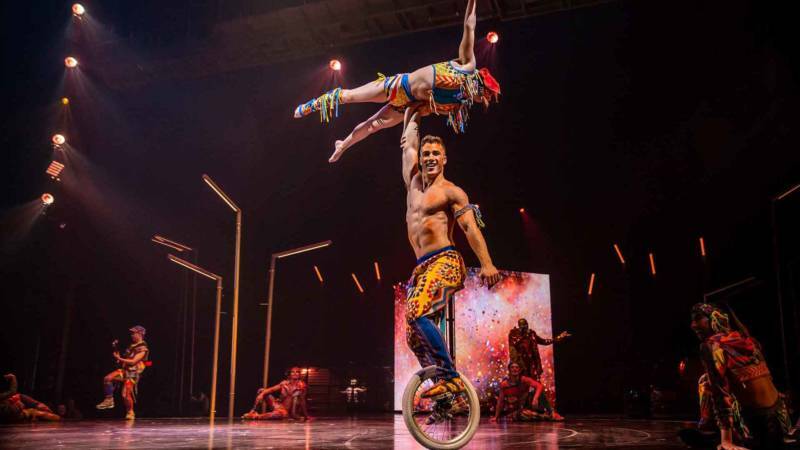 All of these acts elicit real-life oohs and aahs from the crowd like circuses of old, but they're performed elegantly and with purpose, Cirque du Soleil seems to want you to know. The violin player can't just be a violin player—she must play an electric aqua-blue violin shaped like a swordfish. The clown can't just be a clown—he must be fabulous diva, with cheekbones that could slice a turkey, who dances with petulant laundry machines. The soundtrack sounds like what happens when Sting tries to do "ethnic" music. Nobody has anything resembling a normal hairstyle. Though this be madness, yet there is merriment in 't. Volta ends with a synchronized heavy metal BMX bike routine, suddenly transforming the circus into the X-Games. But when I looked around to the people in the stands last week, every one of them—ladies and gentlemen, boys and girls, children of all ages—had the same look of dazzled wonder in their eye. The circus may change, but humans' capacity to blow each other's minds is eternal. Cirque du Soiliel's 'Volta' runs through Feb. 3 at the AT&T Park parking lot in San Francisco before heading to San Jose. Details here.